When Hella Winston began talking with Hasidic Jews for her doctoral dissertation in sociology, she was excited to be meeting members of the highly insular Satmar sect. While several Jewish journalists and scholars have produced largely admiring books describing the Lubavitch way of life and that group’s outreach efforts to unaffiliated Jews, very little has been written about the many other Hasidic sects in the United States. Unlike Lubavitchers, members of these other groups are raised to avoid all unnecessary contact with outside society, including contact with other Jews. Winston’s access was all but unprecedented. As a nonobservant Jew with little prior exposure to the Hasidic world, she never could have guessed what would happen next-that she would be introduced, slowly and covertly, to Hasidim from Satmar and other sects who were deeply unhappy with their highly restrictive way of life and sometimes desperately struggling to leave their communities. First there was Yossi, a young man who, though deeply attached to the Hasidic culture in which he was raised, longed for a life with fewer restrictions and more tolerance. Yossi’s efforts at making such a life, however, were being severely hampered by his fourth grade English and math skills, his profound ignorance of the ways of the outside world, and the looming threat that pursuing his desires would almost certainly lead to rejection by his family and friends. Then she met Dini, a young wife and mother whose decision to deviate even slightly from Hasidic standards of modesty led to threatening phone calls from anonymous men, warning her that she needed to watch the way she was dressing if she wanted to remain a part of the community. Someone else introduced Winston to Steinmetz, a closet bibliophile worked in a small Judaica store in his community and spent his days off anxiously evading discovery in the library of the Conservative Jewish Theological Seminary, whose shelves contain non-Hasidic books he is forbidden to read but nonetheless devours, often several at a sitting. There were others still who had actually made the wrenching decision to leave their communities altogether. Already called a “must read” by Hasidic blogger “Shtreimel,” Unchosen tells the fascinating stories of these and other rebel Hasidim, serious questioners who long for greater personal and intellectual freedom than their communities allow. In so doing, Unchosen forces us to reexamine the history of these communities and asks us to consider what we choose not to see when we romanticize them. "Remarkable… Conclusion about Unchosen? The best book on its subject. Good for Hasidim, non-Hasidim and every reader who responds to one of the oldest plots on Earth - the need of some people to leave the community that raised them, and figure out the world for themselves." "It reads more like fine journalism than a scholarly work. But Winston does place her findings in a larger context of American life, raising questions about the role of boundaries and how these communities will navigate the future." "Fascinating case studies…Winston shows us a Hasidic underworld where large families and a lack of secular education have resulted in extreme poverty and some serious at-risk behavior among youth. Her story of courage and intellectual rebellion will inspire anyone who has ever felt like a religious outcast." 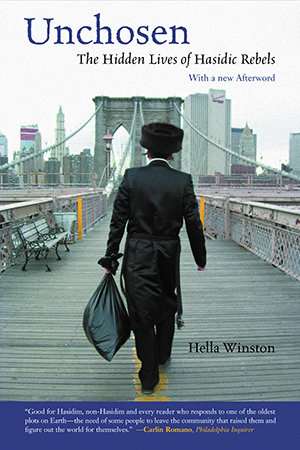 "Hella Winston's honest and compelling study of those aspects of Hasidic life long swept under the carpet is sure to spark controversy. But by bringing to light the coercion, fear, and sexual abuse long apparent to those of us who know the community well, she has done a service not only to the general public but especially to those community members brave enough to speak out. Balanced, well researched, and compassionate, told with narrative drive and great wit, Unchosen: The Hidden Lives of Hasidic Rebels is a must read. " "Unchosen is a terrific book. Winston tells a good story, full of engaging profiles, and she is insightful about what propels these rebels away and what holds them back. Beyond the interest and significance of the topic, Unchosen serves as a strong local lesson in one of the great social, cultural, and philosophical questions: What happens when we emerge, even a little, from the ideology of our group? How does doubt look and feel, what are its stages, and how does it work? Highly recommended."